The cinnamon bread was at the turkey leg stand on international street last weekend. .... And it was superb. We ended up getting two loaves to share amongst us. IMO it is the best KI food item, especially in the dessert/sweet category. Well, I'm FINALLY getting my chance to see Winterfest next Friday. Here's hoping for my first coaster snow ride. Can someone answer a question? I have the drink plan this year and was wondering if hot chocolate is an option during winterfest? We went Friday at open. Went straight for Mystic Timbers and it was closed for weather and it would be a lengthy wait. I found it odd bc I know I’ve seen where folks here said they got a 30 degree ride on it. And the weather was completely clear. Unless there could have been ice on the tracks? The park was honestly dead and we only had an hour to ride before we had to go get the kids from dc so we missed out. MH was convinced that they didn’t want to run it bc there weren’t enough people at the park yet. Could that be? I believe that Mystic Timbers has a minimum start up temperature. It was 33 when I got to the park last night at 4:45. Mystic Timbers never opened last night as the temperature only dropped. There were still people pouring in when I left around 7:30. Oh wow, Thanks! No idea it had a min. start up temperature it was very cold last night. Can someone tell me what’s included in the IS buffet? I’m not sure it would be worth it for a vegetarian. Any must have side items that aren’t available at other places in the park? Hey everyone, If you recognize me I'll be at Kings Island winterfest tonight. And if no one does recognize you...you won’t be...that’s kinda surreal. See page 9 of this thread for the IS Winter Buffet menu (there is a blend of zucchini and squash in a red pepper sauce that might be appropriate for vegetarians). There is a different menu for the Reds buffet for which the menu is also listed earlier in this thread. I had heard about the ice on the track as well, but yeah, it could most likely be due to Mystic's startup temp. I was also there last night and had fun despite being tired from walking around at the zoo earlier that day. I really enjoyed seeing The Mistletones, who really benefitted from having a seperate stage as opposed to last year, where they shared the stage with Jingle Jazz (each group rotated out on the half hour). This really gave them a chance to shine and because of that, I enjoyed their show a lot more this year. I also saw the Charlie Brown Christmas Spectacular, was slightly better than last year (still not my cup of tea, though...). In addition, I got my picture with Schroader (finally!) and said hi to Mr. and Mrs. T.
Does anyone have a short list of the places that serve good hot chocolate versus brown hot water? About the only positive comment I can provide about the hot chocolate last year was that it was (usually) hot. The Mac and cheese bar had the machine hot chocolate. It was delicious!!! ill let you know if I see another. And half price at 9:45. I agree. I still love the way they put the lights on the buildings at Dollywood. The attention to detail and the different color lights that they use is simply amazing. I too struggle with the Dollywood vs. KI. I think from a pure lights standpoint, I would give the edge to KI. Glacier Ridge was heavily hyped but was a bit of a letdown after going to their Illuminights. 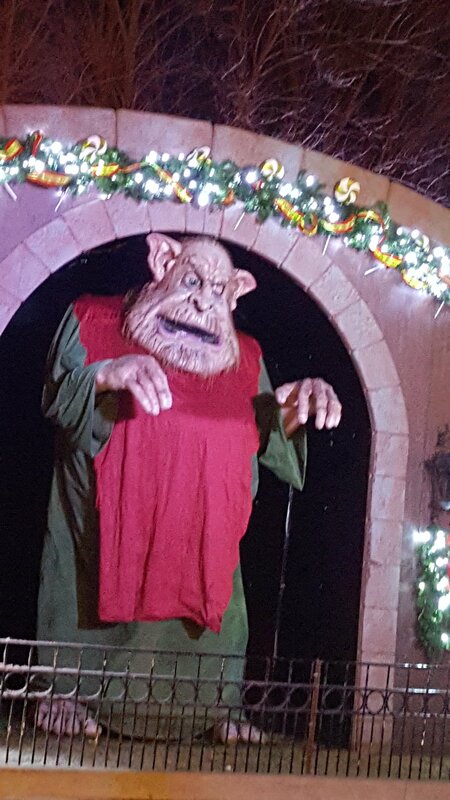 Dollywood actually felt like it has less lights this year vs. previous years. From a show standpoint, DW still is ahead but it is getting closer ever year and I might give the slight edge to KI overall. FYI - this was not true on Saturday, December 8th. The park didn't open until 4pm AND international street was also not open until 4pm. I'm not sure what has happened other Saturdays this season. Twas also frustrating to then hike all the way back to MT...closed (weather/too cold). Then hike all the way over to Flight of Cheer....closed (technical difficulties). There was a note at the gate that generically stated "some rides may be closed due to weather". It would have been nice to state specific rides that are actually closed/delayed start. At least the walk warmed us up a little from standing at the unexpectedly closed entrance gate for so long. We did have fun ice skating in the 5pm time group. We were on the ice during the lighting ceremony...it was very beautiful! I was there that night too. I thought it was strange they waited until open to warm up the rides. It felt like they forgot the park opened at 4 instead of 5. 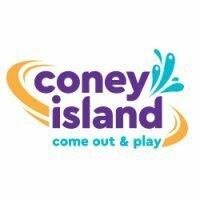 Even though the park is opening at 4 on certain days, the rides are not opening until 5 regardless of the day. I think it mainly has to do with labor laws because the extra hour would throw off the way they run breaks and stuff like that. Rides were indeed open at 4 this past Saturday. 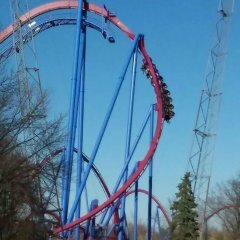 Mystic opened a bit late but they were doing test runs at 4. I rode Boo Blasters, Shake Rattle and Roll, and Dodgems and the Carousel first thing before 5pm. It was appx 26-28 degrees when I arrived last Saturday at 4:30 is and I think it bottomed out at 24 degrees. Both coasters were running all night long everytime I went by them. Well, per Chad on Twitter Winterfest is apparently starting daily operation tomorrow. 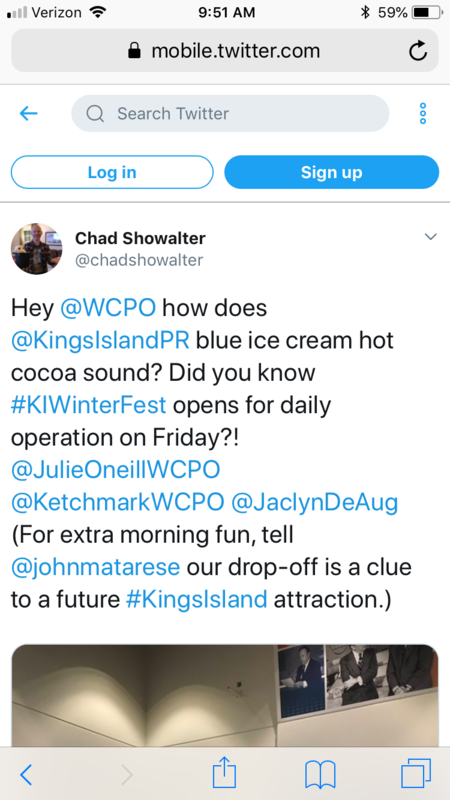 He invited WCPO for some Blue Hot Chocolate and a clue regarding a future attraction. @beastfan11 Well, per Chad on Twitter Winterfest is apparently starting daily operation tomorrow. That is correct. I hope people get the photo! I'm going to Winterfest as a guest for the first time this year tonight, I can't wait to see the whole park instead of just the small area of Rivertown I'm usually at every night. 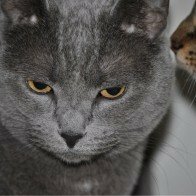 Is there anything I should absolutely make sure I do/try? The umbrellas. They should be very popular this evening. Of course one of the only nights I scheduled off it rains, just my luck!